One of the purposes of an Optimist Club is to inspire good citizenship and respect for law and in 1965 Optimist International established the Respect for Law program. According to a brochure from Optimist International, the intent wast to familiarize youth with the people in their community who work hard to make it a better place to live. "It is vital that youth recognize the contributions that law enforcement officers make to their community and that they realize these officials are there to assist them if needed." Through the years, the program has become less about children and more about the officers. As a way of showing respect and appreciation for their service, many Optimist Clubs bestow Officer of the Year honors on deserving public servants. Some recent awards follow. In Arkansas City, Kansas, Police Officer Troy Cochran was honored by the Optimist Club. In Waukesha, Wisconsin, the Optimist Club recognized Correctional Officer Erin Billeb for her work as a training officer in the Waukesha County Jail, especially for her role in assisting inmates who deal with mental illnesses and chemical dependencies. 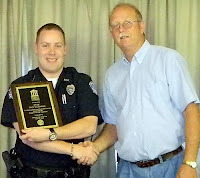 Not every Optimist Club chooses to honor a single officer. In Chattanooga, Tennessee, the Optimist Club showed their appreciation to the Chattanooga Police Special Weapons and Tactics Unit (SWAT). The team was nominated by the Chief of Police Bobby Dodd for their service as officers who never receive a routine call. Her sentiments are why more than 1,500 Optimist Clubs participate in the annual Respect for Law activity by honoring their own. 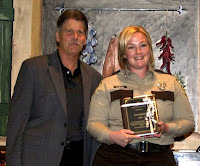 Photos courtesy of the Arkansas City and Waukesha Optimist Clubs. If you were on Twitter today, you may have seen that Oreos were trending. 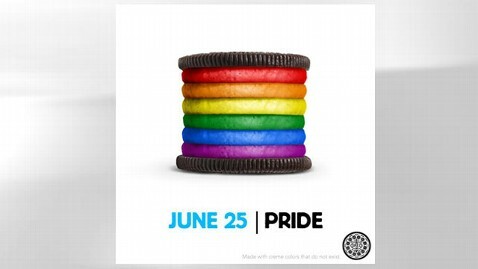 I clicked on a few links to discover that the #dailytwist was a rainbow filled Oreo in honor June 25 | Pride day. ABC News went on to report that the cookie and its message first appeared on Facebook sparking an Oreo boycott. How sad that people can be so closed-minded, but they are. I was surprised in the opposite direction yesterday when I stumbled upon a video posted by a brave young man from Ohio. He had recently won the Ohio District Optimist International Oratorical Contest and at the prompting of his English teacher he recorded his speech and posted it on YouTube. I got emotional as I watched him because not only is his speech powerful and his delivery authentic, it is also the first openly gay message that I have heard advanced in the organization. I'm proud that the days of don't ask don't tell are coming to an end and I had planned to post the video here today well before I knew anything about the Oreo outrage. Now it is even more appropriate that I send this message to all. I am intolerant of intolerance. 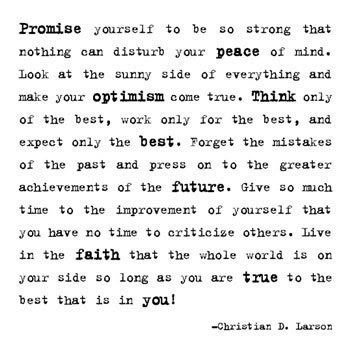 We must, as Optimist Club members, as human beings, accept that people are different and that our differences are better celebrated and not feared; accepted and not banned. Please watch the Ohio finalist as he explains, "How My Optimism Helps Me Overcome Obstacles." I hope you find his message worth sharing too. Today's choice for Music Sunday at Experience Optimism is all about the movement. The Cha-Cha Slide movement that is, by Mr. C the Slide Man. Are you ready [y'all]? Clap your hands and get up and move! Of course there is an optimistic reason for showing the Cha-Cha Slide. The Middleton Area Optimist Club in Idaho has begun a Free Movies in the Park series for its community. Movies start at dusk, but in Idaho it doesn't get dark until after 9:30 p.m. That means there is plenty of time to entertain the guests who have arrived, some with their entire families, before the show starts. Music is a given and the Cha-Cha Slide gets many out of their seats to move. I thought I'd share it here and get some practice in before the next show. Join me, won't you? It's good for you to get up off of that seat. Here is a story that brings my alma mater together with my interest in Optimist Clubs. The Kent State University Golden Flashes made its first appearance at the College World Series. In honor of their achievement, the Optimist Club of Papillion, a suburb of Omaha, Nebraska, treated the team to a steak dinner and barbecue on Father's Day. The team got to meet local children and their families and relax in a family-style setting to ready themselves for the next game. The coaches were honored with gifts and the team held an autograph session for the children. According to event organizer and Optimist Club member Fred Uhe, the Optimist Club has been hosting a reception each year for one College World Series team and their families since 2004. Kent State coach Scott Stricklin remarked, "Father's Day in Omaha, it doesn't get any better than that. It's every player's dream; it's every dad's dream; it's every coach's dream to spend Father's Day in Omaha. But that's where we are and we are thrilled to be here." Watch some of Coach Stricklin's address to the Optimist Club on YouTube. Kent State opened with a loss to Arkansas and came back to defeat the No. 1 seed Florida. They fell in the final game to South Carolina. See photos of the Pappillion Optimist Club and the Kent State Flashes on Flickr. See more about the Optimist Club reception at Omaha.com. 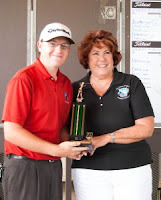 With more than ten alerts in my inbox today about golf, I would say the most predominant activity taking place with Optimist Clubs this month is the Optimist International Junior Golf Championships. The Oklahoma District held its qualifying tournament on Wednesday. Placing first in the Girls 15-18 Division was Anna Kim and in the Boys Division 16-18, Holden Crago. Both are shown here with District Governor Judy Evans with the Bixby Optimist Club. Twenty-five golfers participated in the tournament at the Page Belcher Course in Tulsa. Anna and Holden advance to the Optimist International Junior Golf Championships at the PGA National Resort and Spa being held at the end of July. 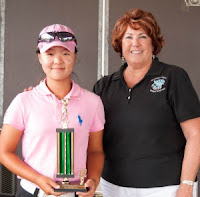 See all qualified junior golfers at this link. This will be updated until all Districts have reported. Thanks to the Oklahoma District - Optimist International for the story. Something about this song keeps me coming back for more. What is it? "Everybody talks" by Neon Trees. With more than 3 million views on the official VEVO channel, I think there are a lot of people coming back to sing along or perhaps to watch the zombies on the drive-in theater screen. In case you haven't noticed, Americans sure seem to have a thing about zombies. The CDC has even launched a page to help you prepare for a zombie attack: Preparedness 101: Zombie Apocalypse. The zombie apocalypse probably won't happen anytime soon, but that link to the CDC will help you discover everything you might need in case you are forced to evacuate your home for any reason: flood, hurricane, gas leak, you name it. The fun approach to emergency preparedness has garnered more than 1,000 comments. I'd say there is a lot to be learned from sharing something fun, frivolous and unexpected on occasion. Thanks for stopping by Music Sunday at Experience Optimism. A. 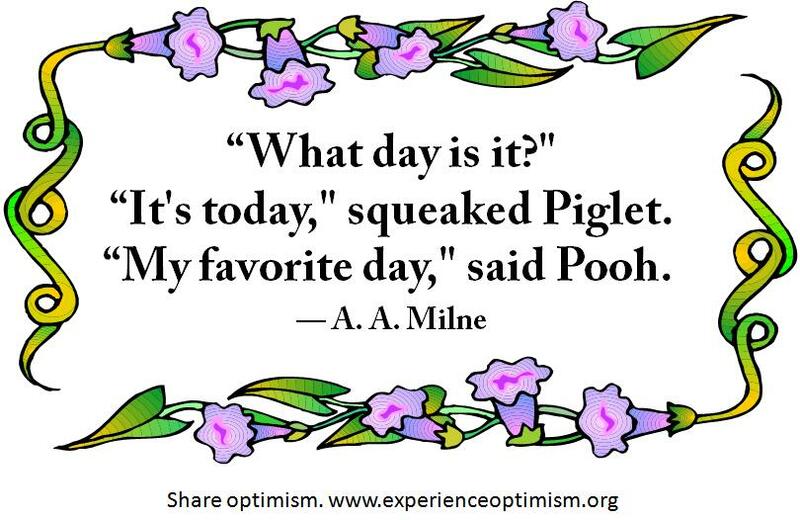 A. Milne, the creator of Winnie the Pooh and his friends in the Hundred Acre Wood, had a simple way of writing that makes the reader happy especially when she is reading aloud to children, and even when she comes upon a quote online. Taking a few lines of the characters' conversation and applying them to our crazy, multitasking world is a way to help us slow down and savor the moment, the beauty and joy of the moment. As Pooh, Piglet and Eeyore and others would amble through the forest, they would learn to trust each other in good times and trying times as they solved problems and shared stories and laughs. Every day they shared optimism, friendship and hope. 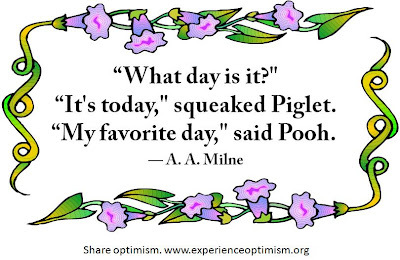 What day is your favorite day? I hope it's today. Erhardt Construction, in Grand Rapids Ada, Michigan, is celebrating its 50th anniversary with the "Building Our Community Contest." Collaborating with a group of building partners, the companies are giving away a construction project and prizes totaling $50,000 to area nonprofit organizations. What a great idea! 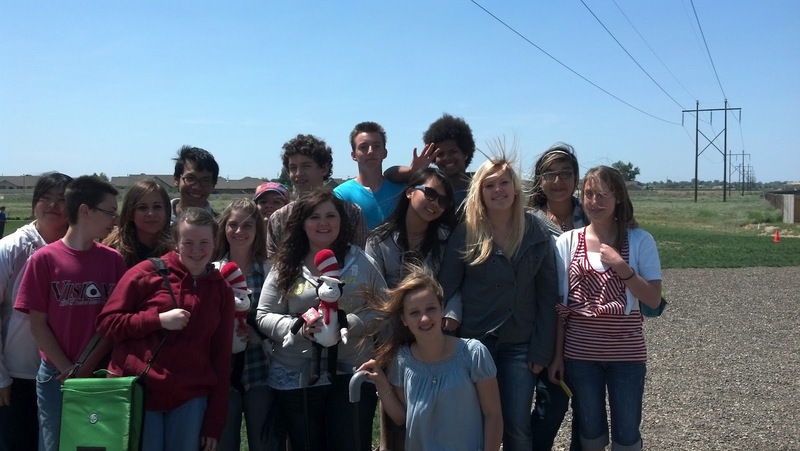 Helping those who do community service by providing a community service. The deadline to enter was Monday, June 11, 2012. According to the company's Twitter feed, applications "poured in as the deadline grew near." And that is where I found the following entry from the Optimist Club of Grand Rapids. The Club's project is to refurbish Camp Optimist, "a 120-acre woodland, full service day camp that was purchased by the club in 1956. Since 2005, the club has been working to refurbish it for the various community organizations that use the camp including the EcoBus Program, Girls Scouts, Boy Scouts and Camp Fire kids, among others. The Optimist Club video features Camp Fire Kids USA enjoying the camp's rustic amenities. Winners will be decided by voting beginning June 18. Good luck to the Optimist Club of Grand Rapids on your entry. I'm by no way aging myself when I tell you that I was surprised to learn from @AARP that Tom Jones celebrated his 72nd birthday last week. Because my parents were concertgoers, I was lucky enough to see him several times, at different ages and venues. The last time was with my mom at Caesars Palace in Las Vegas; so when I heard about Tom's celebration, I had a quiet celebration of my own for the birthdays that I didn't get to have with her. As a bonus, when we saw him in 1987, he looked, moved and enthralled the audience just he does in the video I've chosen today. Plus, at Caesars, many of the ladies were tossing their room keys on stage. Wishes, memories and legends: all true. I hope you enjoy Tom Jones, live at London's Hammersmith Odeon, 1989 singing "It's Not Unusual" for Music Sunday at Experience Optimism. And will do me a favor, please? Celebrate every day like it's your birthday for every day is precious. A week or so ago on Facebook, Julien Smith shared a video from Tedx Somerville: Clarence Smith Jr., "Education by Barbershop." He said there was genius at about 5:35 in the talk. I think there was genius throughout, especially for a blog like Experience Optimism that talks about the power of belonging to a group. The culture that is learned in a weekly visit to a barbershop is similar to what one learns when they attend a weekly service club meeting. Talking to peers, sharing ideas and opinions, and swapping stories establishes values and contributes to an unwritten social and moral code. Visiting your favorite group, whether it is a barbershop or an Optimist Club, when you travel enhances your worldview and enriches the stories that you share when you return home. Stories aside, both are examples of community and today, both are being replaced by social media. Instead of gathering as a group and learning together, we learn independently in our homes, offices, cars and coffee shops as we connect with others online 24/7. Are the relationships as rich? More important, without face-to-face interaction do we risk losing the opportunities to make a difference through community service where we live, work and raise our families? I fear we do. How about you? Ron Klemann, President, Camarillo Noontime Optimist Club, provided the above photo of seven outstanding students who were recently awarded scholarships courtesy of the Optimist Club. There was an informational press release that identified the students, left to right, as Zachary Pedersen, Reyna Montoya, Ariana Reyes, Jordan Jennings, Kaytlin Kuns, Leah Ramsaier and Ariana Cortes. Not shown in the picture is Tesara Santora. Scholarship chairperson Joyce Amer is shown third from left. Each student received a $1,000 scholarship in memory of long-time Optimist Club member Dr. Lynn Merrill Jones. They each presented a brief history and discussed their plans for the future. The recent grads are planning careers in health care. In addition to earning outstanding grades they were active in school activities and community service. I was especially touched by the picture. The fresh faces and casual style of the students showcases hope and potential. Combined with their spirit of community service, they exemplify what Optimist Clubs stand for. Congratulations and good luck, students. Thanks to Ron Klemann for the photo and story. 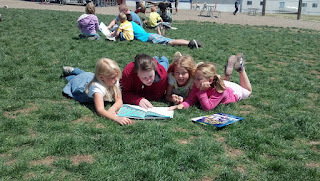 Read-aloud programs are some of my favorite activities, especially when the readers are young Optimist Club members. 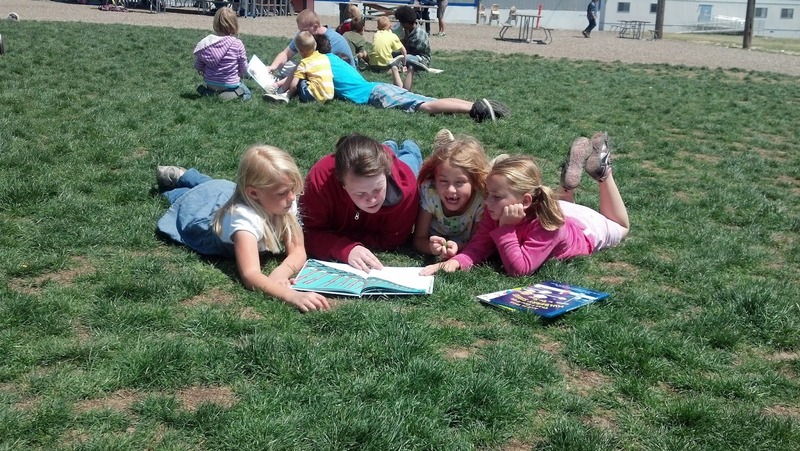 As an end-of-the-year school activity at Vision Charter School in Caldwell Idaho, the JOOI students, part of the Middleton Area Optimist Club, coordinated a read-aloud program for grades kindergarten through second grade. Focusing only on books written by Dr. Seuss, the read-aloud program was called "Seuss on the Loose." The young students, anxious to be dismissed for the summer, were enthralled with the freshman and sophomore readers as they sat in small groups around the soccer field. 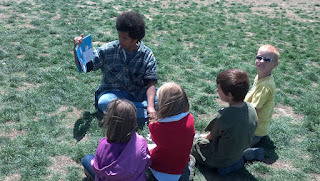 Some students acted out parts of the stories, changed their voices, and tried out other storytelling tricks to keep the younger students engaged. All enjoyed so much that they hated to hear the bell ring that dismissed them not only from the activity, but also from school that day. Annually, JOOI (Junior Optimist Octagon International) promotes literacy through the JOOI of Reading. As with any Optimist Club program, the club is encouraged to make it their own. 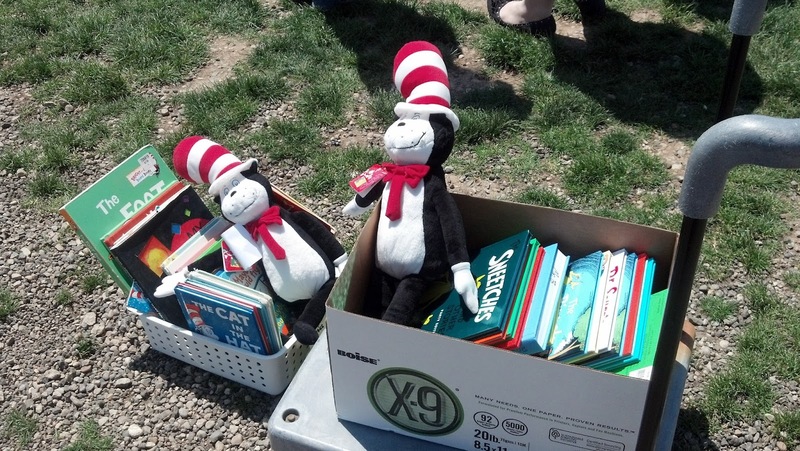 About 150 students participated in the Seuss on the Loose program. They did a great job and plan to do something similar again next year. The coordinating group and readers are shown to the left. Just enjoy the show. That's the message for Music Sunday at Experience Optimism today because baseball season is here. In Boise, Idaho the highest level live baseball we see is the minor league A team, the Boise Hawks, made up of a group of young men who are dreaming of making it to the show. To make it to the show means the rookie player has made the big leagues and has a chance to play a kid's game, and make good money doing it, for a few more glorious years. In the movie, Moneyball, the daughter of former player turned manager Billy Beane reminds her father to enjoy the show. I think it is an inspirational clip full of optimism for the man who is a little too hard on himself about the choices he made early in his career. She reminds him to lighten up and and enjoy "The Show." Originals aren't always the best, not even when they are as perky as Lenka performing "The Show" in this official version from VEVO on YouTube. But I have to say the song is great either way. Enjoy.